Fistfights got a little more brutal, but the big change to Rocksteady’s Arkham trilogy is the long-awaited chance to drive the Batmobile. 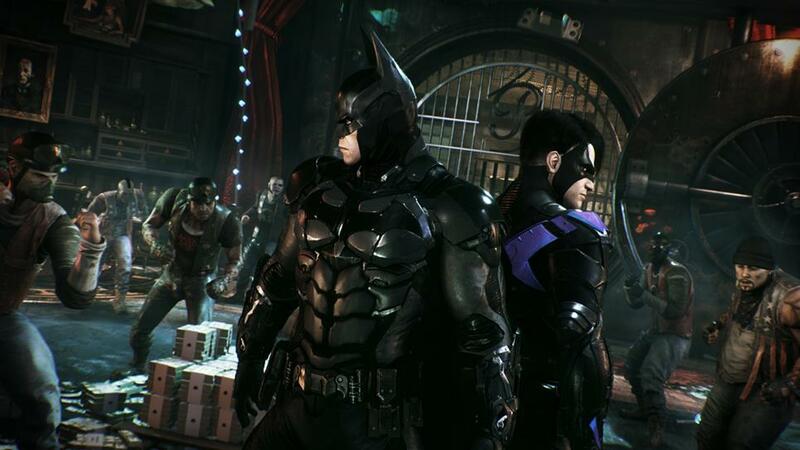 “Be The Batman” is both the premise and a promise from Warner Bros for Batman: Arkham Knight, suggesting a gameplay focus that’s equal parts thrilling and daunting. 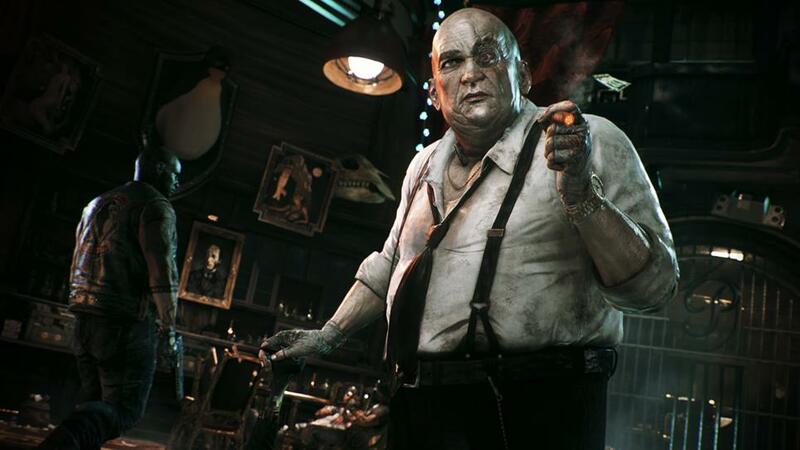 The game’s many and varied activities take place throughout Gotham City, said to cover five times the land area of Arkham City. Since the latter took upwards of 50 hours to explore in the previous chapter, this raises questions about map traversal speed and how we’ll occupy our time as the Dark Knight this time around. The Batmobile takes care of at least one of these concerns in considerable style by swiftly arriving at Batman’s feet upon the press of your controller’s left shoulder-button. 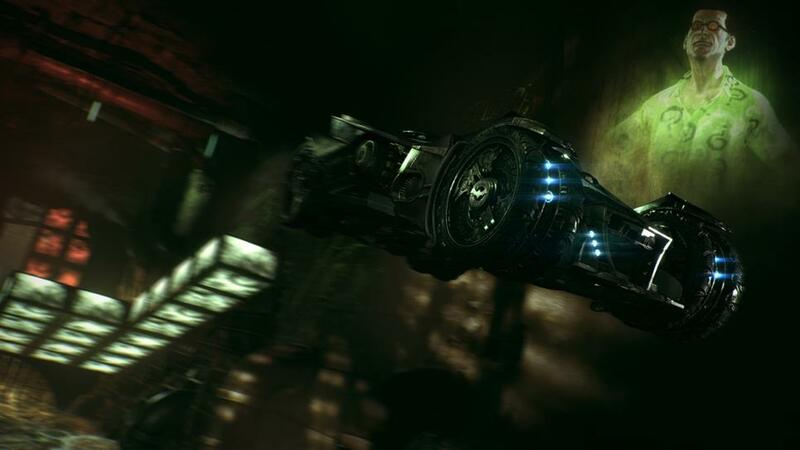 It’s a beast of a vehicle that’s spectacularly designed in the vein of the Arkham series aesthetic. Interestingly, Batman’s suit has also been fashioned to reflect the polished onyx appearance indicating a kind of symbiotic team. In most scenarios where Batman requires Batmobile assistance, even while gliding, he can summon his wheels and basically become this menace of a car. It feels heavy to handle, so don’t expect Ridge Racer or Project Cars, but is fun to control at breakneck speeds during chase sequences and The Riddler’s obstacle-course challenges that we’ll talk more of later. This isn’t all the Batmobile has to offer though, in case you didn’t already know: it’s also a tank. Whenever Batman is behind the wheel, players may switch instantly between Drive Mode and Battle Mode – the latter with an evasion trick to support the use of chain gun and missiles. For the purposes of our hands-on demo, the main mission involved laying waste to one of Penguin’s weapons caches deep within an industrial district. There’s caution here at first as Batman enters a building by a side door, greeted by a security system that involves a control panel and sentry guns. The electronics part is easy, Batman hacking the system to raise shutters leading out into the alley. 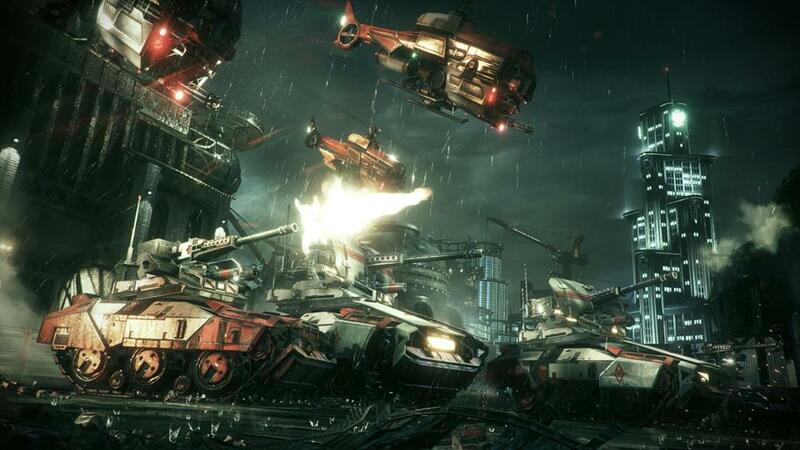 As an early indication of puzzle elements, Batman can remotely manoeuvre the Batmobile into an attacking position, shooting out the sentry guns that are in the way of progress. Now usually, in Batman: Arkham Asylum and Batman: Arkham City, there would be another door to access the next area, but one of the new features for Batman: Arkham Knight allows the big guy to smash through glass-roofed ceilings to make the dramatic entrance we all enjoy seeing. Related to this is an all-new fear factor to consider during any take down. Here, though, Batman is just seeking attention as he grapples to the rooftop before crashing noisily into a room full of Penguin’s goons. At least 20 henchmen go after Batman’s blood during the revamped Freeflow sequence that follows. It’s pleasantly familiar, because it’s still brilliant, how every combat move links seamlessly to the next. Now, though, there are context sensitive take-downs such as smashing a hood’s head into a fuse box, and special Dual Take-Down techniques that involve (in this case) ex-protégé Nightwing. Perhaps you may feel you’ve had more than your fill of Rocksteady’s famous Freeflow combat, but we hugely enjoyed the ease with which new and more elaborate martial skills were performed. Freeflow in Batman: Arkham Knight feels weightier and therefore more satisfying. It’s intricate but not too subtle. For another layer of finesse, a Fear Take-Down option has been added to Batman’s repertoire, during which up to three startled enemies can be socked to the jaw in sequence. Bad guys that are susceptible to fear are highlighted orange, allowing Batman to pick his battles carefully. For demo purposes, our sequence involved rescuing a fire-fighter hostage without raising the alarm. Again, Batman took to high ground for the attack after soaring down onto a windowed rooftop. Nervousness as a consequence of stealth isn’t something usually factored into the Batman Arkham experience, and as such is very welcome. However if adrenaline is what you seek, one sequence involving the pursuit of pyromaniac Firefly is guaranteed to get your pulse racing. It’s impressively staged, perhaps owing to Firefly’s history as a movie special-effects technician, and involves a high speed chase through the Gotham streets. If Batman stays hot on Firefly’s smouldering heels, he’ll eventually tire and temporarily become susceptible to a take-down. Again, this demonstrates how simple it is to enter and exit the Batmobile while on-the-move, transitioning from driver’s seat to airborne in the blink of an eye to launch close-quarters combat attacks. Finally, for a truly dizzying display of Batmobile agility, the Riddler’s challenges have stepped up the pace. They now include obstacle course races owing their zany style to 1990s console classics F-Zero and Wipeout, but the cunning Riddler has added switchable platforms that block/un-block tunnels or remove and replace sections of the roadway at Batman’s command. Building momentum carries the Batmobile up the curving walls, turning the world on its side. It’s a Six Flags style rollercoaster only it’s off-the-rails, and it points to the varied sideline activities Batman is set to face in Gotham. One thing we wish we could’ve seen, but was only suggested during a time with Batman: Arkham Knight, is how the presence of Scarecrow (voiced by Fringe favourite John Noble) affects Gotham. Our wish is for something along the lines of the nightmare sequences from Batman: Arkham Asylum. The only guarantee, from the mouth of Rocksteady social marketing manager Gaz Deaves, is that Batman can never fully believe his own eyes during the course of this concluding adventure. Our hero isn’t the only one capable of using fear as a weapon, nor is he the only character driven by the pain of loss as Harley Quinn’s darker persona testifies following the death of her beloved Joker. 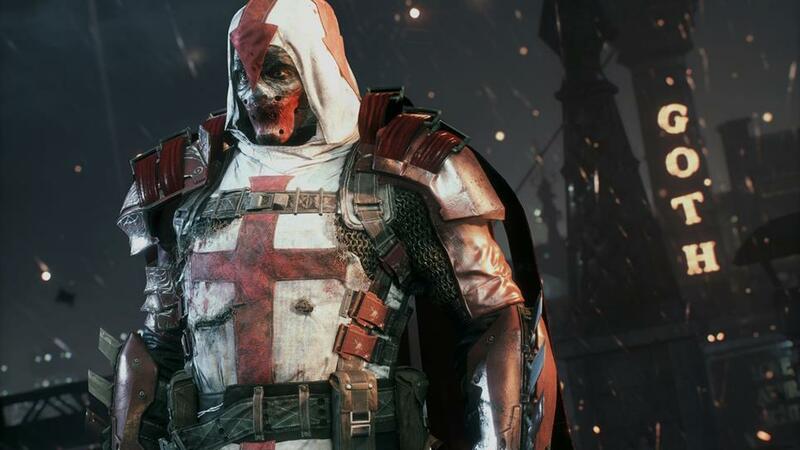 Batman: Arkham Knight is released for PS4, Xbox One and PC on June 23.